If it's spring in the Sonoran Desert, you just have to visit the Butterfly Pavilion at the Desert Botanical Garden here in Phoenix. If you're lucky (and I'm always lucky when I visit), you'll have a resident-- like this Queen butterfly-- pose for you so you can take its photo! That is an absolutely gorgeous photo. I love butterflies, and rarely see them up close. I love butterflies, too, Elena, so I always get a rush when I manage to get a decent photo of one! What a lovely photo! I do love visiting a butterfly pavilion too, they're always so fascinating. That could be a cover shot - fabulous. Thanks. I have to admit that I was quite pleased when I saw this one pop up on the monitor! She is beautiful! I love the butterfly houses!! AWWW She is stunning! Thanks for sharing these! My Snapshot. There's nothing more beautiful than nature. I am in complete agreement, Lisa! SOOO beautiful! I do love the delicacy of those wings, and admire them in flight. What is amazing is seeing one whose wings are so raggedy that you wonder how it can still fly. They are wonderful creatures! It's one of my favorite species of butterflies. Wow, what a wonderful photo! Oh, that's absolutely beautiful! It looks like our Monarch butterfly. Spring is such a wonderful time of the year-- even for places that don't really have a winter! They so very seldom are. It takes patience to photograph these lovelies, doesn't it? That is pretty magical. I'm assuming you didn't capture that on your i-phone? LOL! I have a "sel" phone... which is short for "seldom-used." I'm not a phone person, and just have a mobile for emergencies. I liked your lizard, too! It seems I can watch the butterfly and flower forever. There's something mesmerizing about butterflies. I'm glad you liked it, Irene! Oh, how wonderful. You must be incredibly lucky. I've never been able to get a butterfly to sit still long enough for a picture. That's a great picture. Our family loved visiting the butterfly gallery at Science North in nearby Sudbury, ON. I never have managed as good a picture as this, though. Lovely butterfly photo. 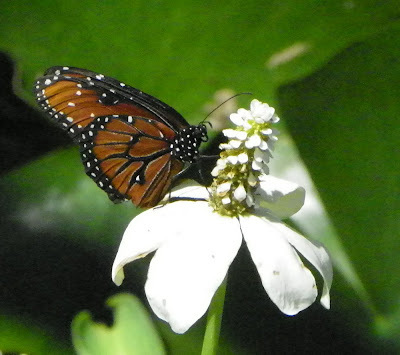 I am going to suggest a trip to the Butterfly Pavillion on our next visit to the Phoenix area. I didn't get to comment yesterday. Was away on a Quilters Retreat at a place that had no cell service, and only sporadic internet access. I know those places quite well, Judy. Thanks so much for stopping by! That can often be the way-- we don't visit what's right on our own doorstep, but travel thousands of miles to see something else. I can be very guilty of that. That's a beauty. It's butterfly season now in the Midwest and I've planted flowers to (hopefully) attract them to my yard. Good luck, Leslie! I know that these little beauties can be a bit temperamental sometimes!